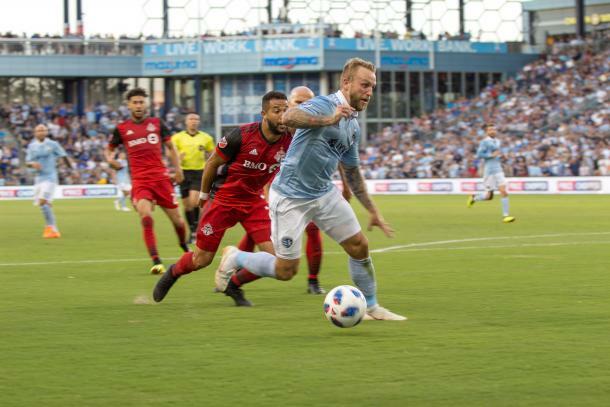 A 2-2 draw was the result on the night as both Sporting Kansas City and Toronto FC looked for three points to steer their seasons on the right track again. Sporting Kansas City: Melia; Zusi, Opara (Amor, min. 73), Besler, Lindsey; Russell, Croizet, Sánchez, Kuzain, Fernandes; Rubio (Shelton, min. 71) (Belmar, min. 80). Toronto FC: Bono; van der Wiel, Zavaleta, Hagglund, Morrow; Delgado (Hasler, min. 67), Fraser (Ricketts, min. 67), Bradley, Osorio; Hamilton (Akinola, min. 88), Giovinco. SCORE: 0-1, min. 25, Osorio. 1-1, min. 57, Sánchez (PK), 2-1, min. 61, Russell. 2-2, min. 69, Hamilton. REFEREE: José Carlos Rivero (USA). Yellow Card: Zavaleta (min. 56), Fraser (min. 59), Zusi (min. 81), Kuzain (min. 90+4). 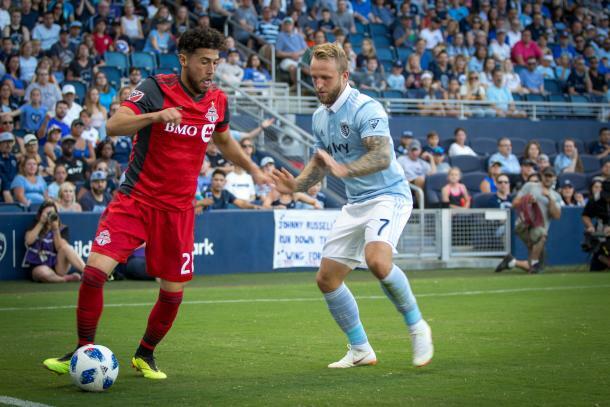 Neither Sporting Kansas City nor Toronto FC could find a winning goal tonight as both teams ended their weekend Major League Soccer action in a two-two draw. The first half saw the home side try to push Toronto back early and capitalize on what could be seen as a fragile backline. Johnny Russell had the first clearest sight of goal in the 8th minute when he was picked out at the back post but his header went narrowly wide of the far post. Sporting continued to press Toronto back and when Marco Delgado gave the ball away in his own half in the 17th minute, Sporting quickly played the transitions and found Graham Zusi out at the edge of the area unmarked. The former US international went for goal and Toronto had Alex Bono to thank when he tipped the long range effort over the bar. For all of the hosts' pressure, it was Toronto that broke the deadlock in the 25th minute with a goal by Jonathan Osorio. Some good interplay in midfield allowed Sebastian Giovinco to pick out Justin Morrow on the left hand flank. Morrow then proceeded to send in a low cross that Osorio redirected past Tim Melia to put Toronto ahead. 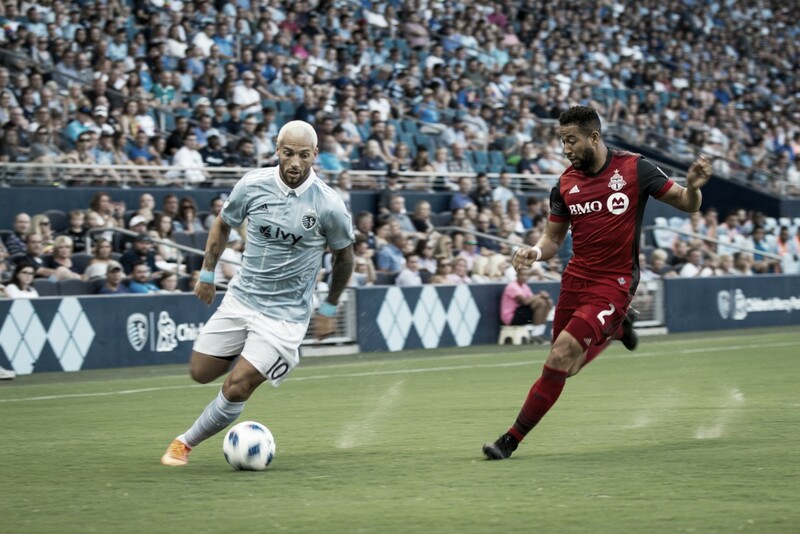 It was a goal against the run of play as Sporting KC had clearly been the better side of the first half but Toronto took their chance when it came to them, whereas Sporting had not. As the second half rumbled on, Sporting continued to be the more dominant team and created more chances to bring themselves level in this game. The home team got their reward in the 57th minute when a penalty was called after Eriq Zavaleta brought down Gerso Fernandes inside the box. Bono guessed the right way but Ilie Sánchez' penalty was hit too well for the TFC goalkeeper to be able to reach it in time, bringing the scoreline to one-all. Sporting then took the lead for the first time in the match four minutes later when Toronto again lost the ball in a critical position in their own half and Diego Rubio played Russell through on goal. The forward calmly finished low past Bono and put Sporting back in control of the game. Full credit should go to Toronto who did not wilt after conceding so many goals in such a short period of time. They found their second goal of the match in the 69th minute, pulling level once more with Sporting. A giveaway near their own area allowed Jordan Hamilton to pick up the ball and then proceed to thump a curling effort past Melia into the top corner. Both teams pushed for a winner but in end, they had to share spoils after a great evening of soccer.